US Secretary of State Colin Powell has pledged the US will stay committed to rebuilding Afghanistan. Mr Powell met President Karzai on a visit to Kabul and vowed that Taleban remnants would not be able to "turn the clock back". He also praised Pakistan's military drive on the Afghan border, which has seen the fiercest clashes there yet. Islamabad says the number killed in the offensive has risen to 39 - 15 soldiers and 24 tribesmen or al-Qaeda suspects. The BBC's Paul Anderson says the US has yet to prove the success of its Afghan mission. Al-Qaeda leader Osama Bin Laden is still at large, while resurgent Taleban forces control large parts of the south and east, with President Karzai isolated in Kabul. US officials are keen to stress their support for Afghanistan, with elections drawing near in both countries. Mr Powell met President Karzai after visiting a school to witness registration for national elections scheduled for June. Mr Powell said: "The United States is in this for the long haul. [The Afghan people] don't have to hope we will be here. We will be here." He said President George W Bush was committed to rebuilding Afghanistan, securing its constitution and working for a better future for the Afghan people. The United States would pledge an additional $1bn in reconstruction aid for Afghanistan at a donor conference in Berlin this month, Mr Powell said. 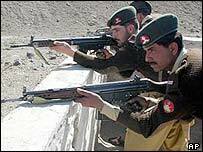 It has long been thought that Osama Bin Laden and leading elements of al-Qaeda are hiding in the mountainous region separating Afghanistan and Pakistan. The US and Afghan governments have been keen to dampen recent speculation that Bin Laden may soon be caught. 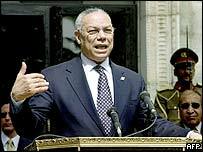 Mr Powell pledged the US would continue its own military battle against Taleban forces. "There are still remnants of the Taleban who will try to destabilise [Afghan] efforts and turn the clock back. That will not happen," he said. President Karzai pledged Afghanistan would do all it could to help Pakistan in the "fight against terrorism". "We are willing to extend every co-operation," he told a joint news conference with Mr Powell. The US secretary of state, who arrived in Kabul from India, will end his South Asia tour with a visit to Pakistan. "Colin Powell came to Kabul to show... that America's commitment to Afghanistan remains unabated"